Hill work and First REAL Leading!! Hill work, hill work. Sometimes I forget that riding out my own driveway and turning left will take me on a miles long, gradual (some parts a lot less gradual than others) uphill dirt road (after about a mile of pavement, with room to walk on grass on the edge). I’ve been hauling to the lake 3-4 times a week for a couple months now and its getting a little old. Same trails, different day. Not so bad when my riding buddy joins me but Blaze and I both get a little bored alone. Today I decided to take the home dirt road route and it was a good ride. It’s that lovely time of the month that posting a big trot doesn’t sound THAT appealing so I mostly just let him take a nice swinging walk (with much encouragement on that “nice” and “swinging” part) for 6 miles. Trotted maybe a mile total, but mostly the walk. Partly sunny weather and a cool breeze and only one car showed for the whole hour and 45 minutes. Sometimes breaking routine and trying something completely different is just the ticket! Now to Sheza All Star Leading Filly! I decided it was time to introduce my filly girl to brushing and do some leading work, since they are now consistently staying outside in their paddock w/ shed instead of going back inside to their stall at night. Without the stall and back leading practice built in it was time to be proactive. First I haltered mom and tied her to a corner post inside the paddock. I had to figure a way to handle mom and baby alone so I thought having mom under control and tied (since she stands so quietly) was my best option, then I could work with baby inside the orbit of mom’s watchful eye. I groomed momma D out thoroughly first and that gave Sheza a chance to watch and then, sure enough, investigate. It took her about three strokes of the brush on mom to be up sniffing me and checking things out. After brushing and lots of satisfying belly scratches for D I turned my attention to Sheza. She acted a little sketched out as she always does when I turn my full attention to her but she stood to be petted and haltered fine. I went with the same method of a little pressure on the lead rope and an encouraging pressure on her hindquarters. She fought me like a little fish for the first 10 minutes but nowhere near as dramatically as last time. I held a constant light pressure on her and let her figure out that flinging herself around like a silly filly wasn’t getting the pressure to release. Then she stopped, took a step toward me and voila, the pressure was gone. Ahhh, this made sense to Sheza. Took about 2 more minutes for her to be consistently taking a couple little steps forward at pressure from the halter. 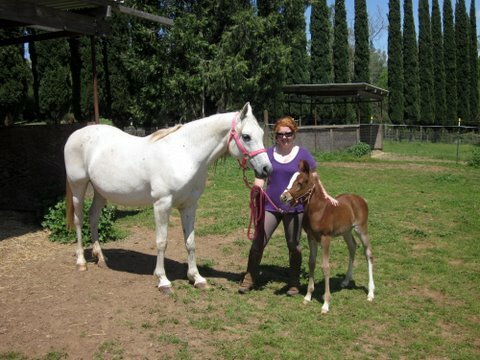 I untied mom and had her at my side, backing mom a step at a time down the paddock, and baby was following a couple steps at a time from light pressure on the lead rope. It had to be maybe 15 minutes total and I was leading mom and baby, one on each side, for a full, non-stop circuit around the paddock!! So cool! Applying pressure and then releasing it the second they start to give to it (making the right thing easy and the wrong thing difficult) really has proven to be the quickest way to teach horses things, young and old, in my experience. I had a friend snap a couple quick photos of us 3 ladies and then it was time to let filly go enjoy herself after doing such a great job. I am a happy horse mom today!